Dental implants are now the most preferred option for treating tooth loss because they offer a permanent solution with over a 95 percent success rate. However, the long-term success of the dental implants relies on the proper care. While caring for dental implants is very similar to caring for natural teeth, there are some key differences that will make all the difference in promoting the success and longevity of the dental implants. As your dentist for dental implants in Ocala FL, Dr. Weldon has the information you need to care for dental implants. Unlike other forms of tooth replacement, the process to get dental implants is more invasive and does take longer. However, when the entire process is complete, you will have the best form of tooth replacement. To begin the process, you will need to undergo a consultation by your implant dentist in Ocala FL. Dr. Weldon will determine if implants are right for you and create a treatment plan. During the first phase of the procedure, a titanium post is surgically inserted into your jawbone. The implant post is biocompatible, so your jawbone will naturally heal to the implant post. However, it can take several months for your bone to fully fuse to the implant. During this time, you will need to keep the area clean and avoid any thing that may irritate the area. 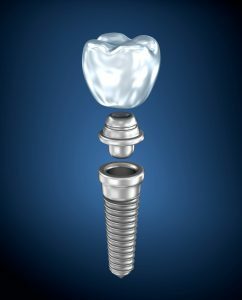 Once the area is healed, an abutment will then be attached to the implant. This allows for a prosthetic crown to be anchored in place to permanently restore your smile. After your procedure is complete, you will need to properly care for the implants to ensure the longevity of the implants and to reduce the risk for implant failure. The biggest threat you face is bacteria and infection. Therefore, you will need to take extra care to ensure your mouth stays as free from bacteria as possible. Choose dental products that are nonabrasive, which will not cause damage to the prosthetic crown. Brush and floss your teeth just as you do your natural teeth; however, pay extra attention to around the abutments and implant posts. Dr. Weldon may recommend you use water flosser or special rinses to help keep bacteria levels down. In addition to your home care, you will also need to visit your dentist in Ocala FL at least twice a year for regular cleanings and checkups. In addition to cleaning the teeth, we will look for any areas of concern or damage. Dr. Weldon may even recommend extra care to ensure the long-term success of your implants. At Weldon General and Cosmetic Dentistry, Dr. Weldon is committed to restoring healthy, beautiful smiles with dental implants in Ocala FL. In addition to offering the consultations and treatment plans for dental implants, Dr. Weldon also provides the aftercare you need to ensure the long-term success of your implants. Get a smile that lasts a lifetime with dental implants and Dr. Weldon.